â€œOur next level is to ensure that exploration is extended to Chad Basin, Gongola Basin, Anambra Basin, Sokoto Basin, Dahomey Basin, Bida Basin and Benue Trough, for more prosperous Nigeria. According to him, they remain â€œkey to the implementation of our budget at all levels of government. He commend the NNPC for the exploration into Kalmani River II Well, which he said, will spur-off socioeconomic activities. 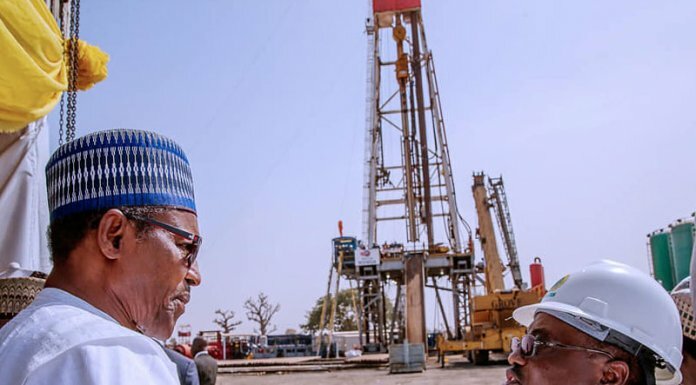 â€œThat era led to the drilling of 23 wells, which two were of gaseous, where NNPC acquired 2,000 square meters of land in the basin,â€ he said. He reiterated his administrationâ€™s determination in pursuing its goal of ensuring adequate security, enhancing the economy of the country, as well as fighting corruption. Earlier in his remarks, the Group Managing Director of NNPC, Dr Maikanti Baru, had said that the exercise started some years back, but had to be suspended in 2000 as a result of the abduction of experts working on the project. While commiserating with those who made sacrifices towards ensuring the realisation of the set goals, Baru said oil exploration was a capital intensive project that took many years to accomplish.